Blogger’s Note: I had another beer-related post in mind for tonight, but ran out of creative juices. This piece originally appear under the headline above as a column in the February 24, 1998, edition of The Pioneer daily newspaper in Big Rapids, Michigan. 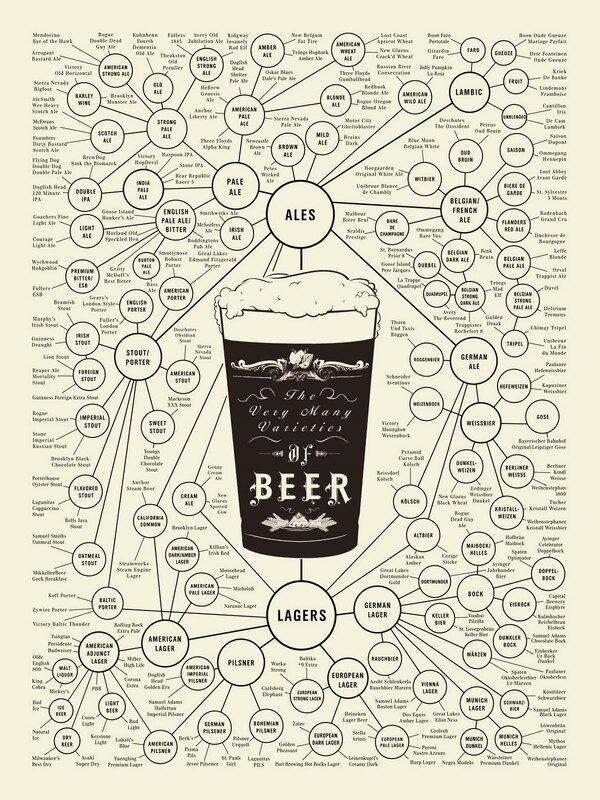 It explains the origins and peculiarities of my love of beer. So gosh-darn cute and innocent, too. Oh, yes … and this awesome poster image above? Not mine, but it can be purchased from the creative minds at Pop Chart Labs. Check it out! The world is home to beer drinkers and beer lovers, and most often the two are not the same. The majority of beer drinkers care little about the alchemy at work in converting bread and water into those heady concoctions known collectively as beer. Most beer drinkers buy their beverages in packs of twelve or more and are content believing that born-on dates and pure mountain water are the two most important elements in choosing a beer. Ever wonder why the less expensive domestic beers tend to tout their water? As beer judge and connoisseur Bob Klein said about one American brew, “…take away that crisp, clean, fresh liquid, and it’d hard to tell what you have left.” Commercial breweries — those with “vats the size of Rhode Island” — speak highly of their water to avoid the Crispix debate: Which tastes better, the corn or the rice? Barley, my friends — barley, hops yeast and water [Blogger’s Addendum: And occasionally a little wheat…] give us ales and lagers; porters, stouts, lambics, pilsners, bocks and barley-wines. The world is home to a great many beers, and I am a beer lover. I began drinking regularly at the “proper” time in my life — my twenty-first birthday — which has given me interesting perspectives on beer and drinking. (At least I think they’re interesting — they seem more so over a room-temperature Guinness.) I drank my first beer when I was three, sitting on my daddy’s knee one summer day at a family barbecue. I was holding his beer for him, and asked if I could have a sip. Dad said sure, assuming, I’m certain, that I wouldn’t like it. I took a sip, and sat quietly for awhile, the took another. A short while later, Dad took the can from me and was surprised to find it all but empty. I did not taste beer again until my twenty-first birthday — seriously. I did it then for two reasons: first, because I was of age — a sort of rite of passage — and second, because my future in-laws were drinkers of beer, and although they never pressured me to do so, I felt I’d like to be able to share the experience with them, and more importantly, be able to offer Jodi’s father and brothers a beer when they came to visit us. A couple of college buddies took me out to dinner that day and ordered me a respectable brew: Sam Adams Boston Lager. It was bitter, nasty, and I drank only half of it. My friends — good friends that they are — said the beer was on them, and to enjoy it or not at my discretion. Still, I was determined to find a beer that liked. The following week, another friend, Steve, introduced me to a raspberry wheat beer (“If you can drink any beer, it’s this one — it doesn’t even taste like beer!” he said) and Woodchuck hard cider (not beer at all). Both were easy to drink, fruity and flavorful. Neither could be offered to Jodi’s brothers with any sort of self-respect. 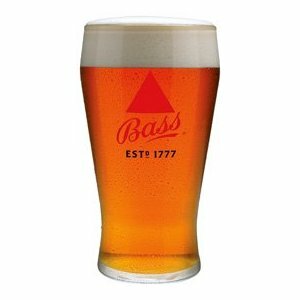 Steve took it upon himself to introduce me to a couple of new beers every week — the following week it was the English classic, Bass Pale Ale, and I was hooked. It was over that first Bass that I first gasped the mystical nature of beer. It occurred to me that, on first swallow, I thought Bass tasted pretty good; the second sip was better, and the more I drank, the more my taste buds relaxed, no longer bracing themselves against the bitterness of the hops or the sting of carbonation. I began to note intricacies of flavor I’d never noticed before, and I felt a certain oneness with the beer, until I was no longer certain who loved whom. I smiled at the revelation that I was no longer sure whether Bass tasted good or felt good, and smiled again at the notion that both were likely true, and it was impossible to extricate one from other. As the weeks went on, Steve introduced me to a world of other beers — some black, some red, some brown, some yellow, and most very friendly. I discovered that when I discussed these beers with others, not everyone felt the same as I. Some beer drinkers liked only light beers, for example, and some beer drinkers, irrational as it seems, didn’t like beer at all. Which is why I say I began consuming beer, and it me, at the proper time. I drink beer because I enjoy the taste (some of which, I’ll admit, is acquired — I do like Boston Lager now, especially on a hot day). I also began drinking beers A) not readily available in groups bigger than six, and B) too expensive to drink in mass quantities. I remember a German exchange student in high school who could not understand her American friends’ fascination with sneaking off with a case of beer to get drunk. In Germany, she drank beer with meals as just another beverage, and she didn’t look at beer (especially American brews) as any sort of thrill or high. I understand that now, but not everyone does. Jodi and I had gone to a bar one evening with some friends of hers from work. 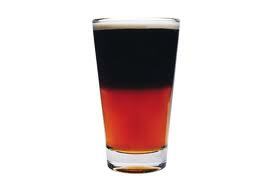 I ordered a tall black and tan (a truly beautiful drink — the magic of physics causes Guinness Extra Stout to float atop Bass Pale Ale, and the layers remain separate: Irish and English, dark and light, yin and yang…). A short while later, I tried a Polish brew, in honor of my mother’s heritage. When my glass was again dry, I ordered a Samuel Adams Honey Porter. I do not drink to excess — after two beers, I was very relaxed and drank the third with scarcely a second’s thought. Call me a beer nut — I would.